In case I’ve never mentioned it, I LOVE animals. Prefer them to most people actually. I’ve never been able to pick a “favorite” animal, but because I had a pet cockatiel for 16 years, I tend to gravitate more towards birds. I’ve been made fun of MANY times because, when out and about, I will stop to take pictures of birds. Not because they’re doing anything particularly birdy, but because hey, here’s one that’s sleeping while standing on one foot. How cute is that? Yeah, I’m obsessed. I am so fascinated. A friend of mine’s husband works at that grocery and said they will sit outside the automatic doors at the store. When someone comes out, the bird flies in to the bakery and pecks open the bread bags for food. It flies back, sits on the big white security alarm tower next to the door, and waits for someone to open it. Then it flies back out with dinner. How flipping awesome is that??? So anyway, I had to run an errand for work today, and as I was passing one intersection, I noticed a Grackle sitting right in the middle of the lane. I thought it was weird to see one sitting like that (because they totally stalk. For real.) I looked in the rearview mirror and saw it kind of topple over then sit itself back up. OMG! There is NO WAY I can just drive away. It can’t move, and it’s going to get hit by a car. That’s just too horrible to think about. Luckily, the intersection is very low traffic at this time of day, plus there is a shopping center right on the corner so it was easy to turn around. I was praying so hard, Please God, keep the cars away. Miraculously, there was not a single car at the light so I was able to pull right up behind the poor little thing. I was sort of afraid of it because I’d seen these bad boys in action. They will totally cut you. She fell over a couple more times while I was walking up to her (it was a girl. I Googled it.) and completely broke my heart. I cupped my hands under her really slow, and she let me scoop her right up. I couldn’t tell where she was hurt, but once she was in my hands she wrapped her little claws around my fingers. You guys? 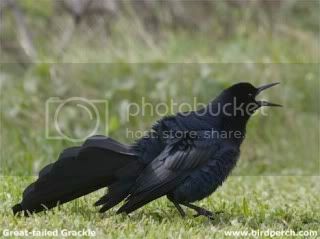 I was thisclose to ending up with a pet Grackle . (Remember that episode of Friends where the monkey grabs Ross’s finger and New York Minute starts playing? Yeah, that was me.) Schlotzsky’s was right there on the corner, and there was a sort of flat, clear area in the garden. I figured that’d be the safest place so I set her down, and she wouldn’t let go. OMG. I wanted to keep her. I talked to her for a minute, and she finally let go and settled down in the garden. Thank you God, for keeping all the cars away so I could save that little birdy. Yes, it was sad because I know if she is really hurt, then it’s likely she won’t make it. But to know that at least, she’ll go safe in a garden instead of on a busy, scary highway makes me feel better. Normally, animal welfare just completely wrecks me. If I see a hurt or stray animal or even roadkill, I just can’t stop thinking about it, wishing I could do something to help, oftentimes, beating myself up about it because I feel like I should have done something, but didn’t. However, in this case, I know I did everything I could do, and I really felt a peace about it as I left. Sure, I would’ve loved to be able to save her completely, but that’s not what was meant to happen. I know many people might think“Oh my gosh Jenny, it’s a bird. Why the big deal?” I used to say the same thing. Why am I getting so destroyed over an animal? Wild, stray, domestic, whatever. I called my mom crying about some poor animal one day and was so upset by how upset I got. She said “Everyone was given a passion about certain things for a reason. God needs people on this Earth to take care of his animals and that’s what He gave you.” So I’m embracing it. Maybe it seems silly to some, but think about what you are truly passionate about. I mean the really deep down stuff that moves you. What if somebody said “Oh that? That’s nothing. Why do you care about that?” It’s not silly to you because that’s the passion you were given by the One who made you. We need that diversity. It doesn’t matter if it kids (my mom) or cheesecake (me). If it’s important to you, then it’s important. Period. Do what you can with the moments you’re given. Even if it seems as simple as picking up a little bird off the street, it's what you were meant to do. To the world, it was just one bird. But to that little bird, it was the world.